DC Super Heroes: My First Book of Super Villains | Nerd Much? As a parent, it can be a challenge to get your kids into the things that you like, and it is a bit disappointing when the first introduction doesn’t take. Sure, your kids don’t have to be into what you’re into necessarily, but wouldn’t it be great if they were? With that in mind, check out the DC Super Heroes: My First Book of Super Villains: Learn the Difference Between Right and Wrong! book by authors David Bar Katz and Morris Katz. 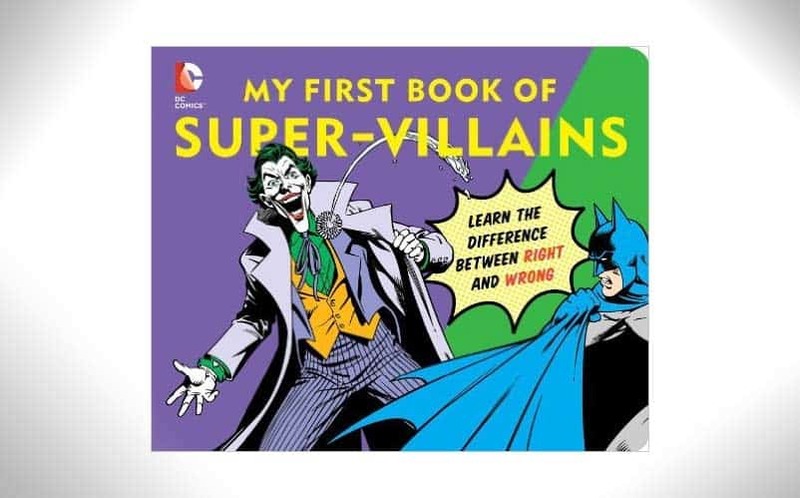 It’s a brilliantly-designed superhero book for kids that gives examples of right versus wrong using humorous examples from DC’s heroes and villains. The board book contains humorously-illustrated pictures of the difference between right and wrong, such as sharing versus stealing, helping versus hurting, and other good versus bad choices. DC’s biggest heroes and villains make an appearance, including Batman, Poison Ivy, Joker, Penguin, and more. It’s a unique book unlike any other we’ve seen, and it’s sure to give your kids a fun learning experience. And, it’s much lighter fare than the current state of DC’s movie universe that’s much more appropriate for kids. There are other similar books by the authors, such as Even Super Heroes Sleep and Super Heroes Book of Opposites. Buy the My First Book of Super Villains here.